"She's your sister. You have to protect her." GKids has unveiled a new official trailer for the animated film Mirai, which premiered at the Cannes Film Festival in Directors' Fortnight earlier this year. 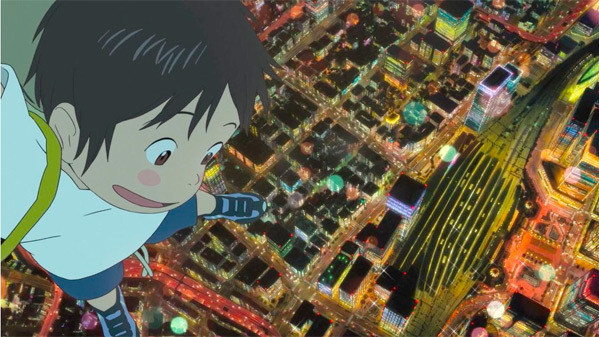 The latest film by master Japanese animation filmmaker Mamoru Hosoda (The Girl Who Leapt Through Time, Summer Wars, Wolf Children, The Boy and the Beast), the film is a delightful adventure following a young Japanese boy living with his parents. His life is disrupted by the arrival of a newborn baby girl, named Mirai, which his parents bring home one day. He soon after discovers a magical garden in his home which enables him to travel through time and meet his relatives from different eras. He's guided by his younger sister from the future. The voice cast includes Haru Kuroki, Moka Kamishiraishi, Gen Hoshino, Kôji Yakusho, Kumiko Asô, and Yoshiko Miyazaki. It's an adorable, whimsical, fun little animated film. Give it a whirl. You can still watch the first festival trailer for Mamoru Hosoda's Mirai here, to see a bit more footage. Watch the other English dub version of the US trailer for Hosoda's Mirai here, if you'd like to see more. Kun, a spoiled 4-year-old boy, comes across a magical garden where he meets his future sister Mirai who is now a young woman and has traveled back in time to see him. Their adventures together help Kun cope with learning how to live with a baby sibling. Mirai, also titled Mirai of the Future (未来のミライ Mirai no Mirai), is written and directed by award-winning Japanese animation filmmaker Mamoru Hosoda, of the films Digimon: The Movie, One Piece: Baron Omatsuri and the Secret Island, The Girl Who Leapt Through Time, Summer Wars, Wolf Children, and The Boy and the Beast previously, as well as "Samurai Champloo". This first premiered at the Cannes Film Festival in Directors' Fortnight. It already opened in Japan in July. GKids will release Hosoda's Mirai in select US theaters starting November 30th later this fall. Thoughts?